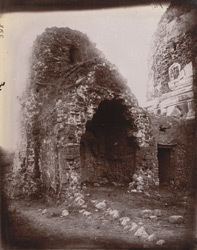 Photograph of the old ruined temple at Katas, Jhelum District, taken by Joseph David Beglar in the 1870s. Katas was the most important place of pilgrimage for Hindus in the Punjab. The town is situated above the Indus river in the Salt Range mountains of northern Pakistan. The structure in this photograph is part of a group of temples built between the sixth and the early eleventh centuries. The group consists of smaller temples arranged in pairs around a central larger temple. The construction of the structure in this photograph dates to the sixth century and it is built in the Hindu Kashmiri style. It has a simple square plan, plain masonry walls and a multiple storied tower. It is badly ruined, making the identification of features, such as the deity that the temple was dedicated to, difficult.